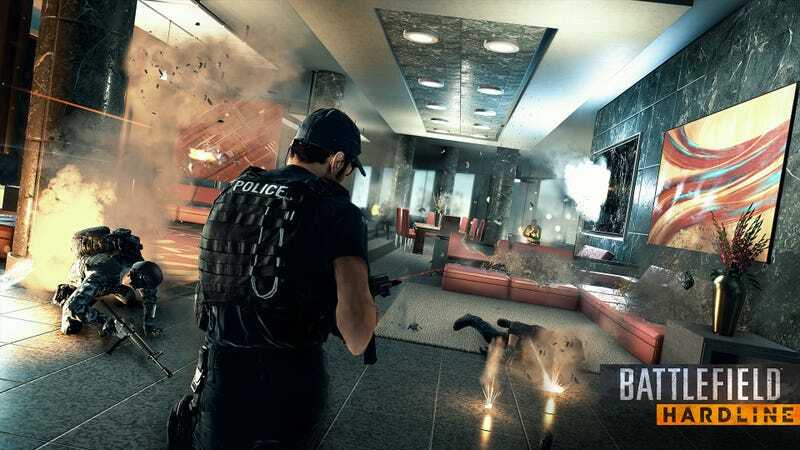 The next Battlefield game will no longer be out this fall—EA announced today that they've delayed Hardline to next year. This delay comes in the wake of the disastrous Battlefield 4, which ran into all sorts of bugs and technical issues when it was released last fall. Since then, EA has promised better things for the series, with EA boss Andrew Wilson mentioning to Kotaku boss Stephen Totilo the company's newfound willingness to delay games that they believe need more polish. Today we are announcing that Battlefield Hardline will launch in early 2015. Obviously, this is big news, so I'd like to address why we're making this change. Back at E3, we launched a beta for Hardline — we wanted to not only show you the game, but to let you play it for yourselves. Millions of you jumped in and had a great time. As a result, the Visceral Games team learned a lot from players about what they wanted in the game. We've been pouring over the data and feedback, and have already been putting a lot of it right into the game and sharing it directly with you. This feedback also spurred us to start thinking about other possibilities and ways we could push Hardline innovation further and make the game even better. The more we thought about these ideas, the more we knew we had to get them into the game you will all be playing. However, there was only one problem. We would need more time. Time that we didn't have if we decided to move forward with launching in just a couple of months. 1. Multiplayer Innovation: Coming out of our E3 beta, internal focus tests, and work with our community, we have received a lot of great Multiplayer thinking. We're going to be adding some new feature ideas direct from the community that will evolve the cops and criminals fantasy into a truly unique Battlefield Multiplayer experience. 2. Single Player Story Depth: In order to ensure our Single Player experience delivers on player expectations, we're spending more time polishing our core features, as well as adding a few new ones that will support a deeper "crime revenge" story experience. 3. Stability: This has been a focus for our team since day one and we're going to be using the extra time to continue to optimize the game for a stable launch. We have learned a lot from Battlefield 4, are continuing to learn from our Community Test Environment and will learn more from another Hardline beta. More time allows us to surface issues that the team can attempt to fix prior to launch. We are doing all of this for one reason. Because we want Battlefield Hardline to be the best game it can be, and so that we can create the best environment for a smooth launch for our players. We will give you updates on our progress and we'll regularly share updates along the way via Battlefield.com/Hardline as well as the Battlefield social channels. In addition to the ongoing development of Hardline, it's important to note that the DICE teams continue to drive Battlefield 4. We continue to explore new opportunities for improvements and we are still releasing new content, including "Dragon's Teeth," the fourth expansion pack that launches worldwide on July 29, and "Final Stand" coming later this year. We remain committed to giving you the best BF4 experience possible.